I hope everyone had a happy and safe holiday. We’re back from a brief break at work to see family and friends in Rochester and while there, we saw the AHL Amerks play Hamilton at Blue Cross Arena. The old barn otherwise known as the War Memorial (it’s former name) has to be considered my ‘home’ stadium. I’ve never taken the time to figure out how many games I’ve been to here, but it surely is a lot. It such a quirky arena with quite a contrast of old and new. The more hockey arenas I visit, the more I realize how special it is as so many of the other (mainly newer) arenas are just sterile. There are so many goofy traditions here that I love: The accordian guy playing tunes as you walk into the arena, how the lights have to be ‘warmed up’ because of their age while the anthem is playing, the Moose, the off-center scoreboard, the old horn and score-o between the first and second period. After a few down years, it was nice to see a holiday crowd of 7,000+ at the game. A completely new management team came in and made sweeping changes on and off the nice, mostly for the good. As for the arena/team nuances, I do like how they brought back the home white uniforms. But I find it horrible they let go the organist for decades, Fred Costello. Hearing the organ was a staple at Amerks games and now it has been replaced by awful, loud and constant pop music. To all these minor league teams who think they need loud music to energize or excite the crowd: please stop. As for the game, the Amerks withstood 47 shots and came out with a 4-2 win. 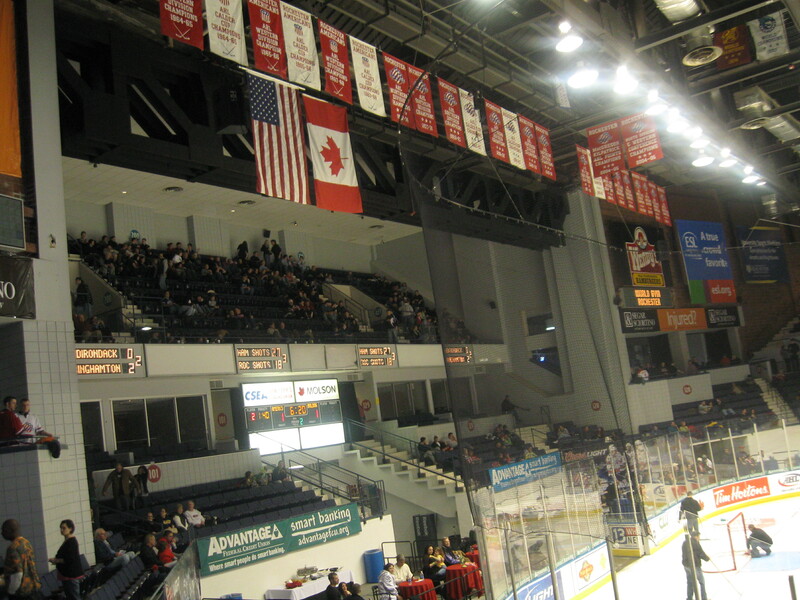 So we say goodbye to Blue Cross Arena….till next year (or sooner if the Calder Cup Finals come calling). As for the next new stadium trip, those plans are up in there as usual. If we get a real nice weather break, I’ve been toying with the idea of spending the weekend in Rhode Island for a couple venues. In reality, we’ll probably sneak away to a nearby facility, but it probably will not be until that week that I decide. Also, if you look at the schedule page, you’ll notice a Texas trip in April…more on that to come!